Oluchukwu said his group was involved in building peace initiatives across the country and urged the state to join in the crusade for promoting peace initiatives. He also assured the governor of their material support to the displaced persons, saying that they would also visit the camps to see things for themselves. Responding, Gov. Ortom commended them for standing with the state in its moments of pain, saying that their peace initiatives would not be in vain. He said peace was paramount for sustained development, pointing out that the killings would not bring about development. He said the anti open grazing law enacted by the state government was aimed at ensuring peaceful coexistence of both farmers and herdsmen. The governor explained that it provided protection to herdsmen against cattle rustling, while also protecting the farmers from cattle encroachment into their farms. Ortom, however, regretted that some people within the country had arrogated themselves immunity against the law by vowing to disobey constituted authority. 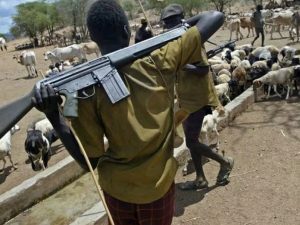 He also regretted the recent killings in Okpokwu Local Government Area of the state and urged the security agencies to arrest the killer-herdsmen. The governor appealed to all Nigerians to join hands in defeating the terrorist herdsmen creating insecurity in communities across the country.